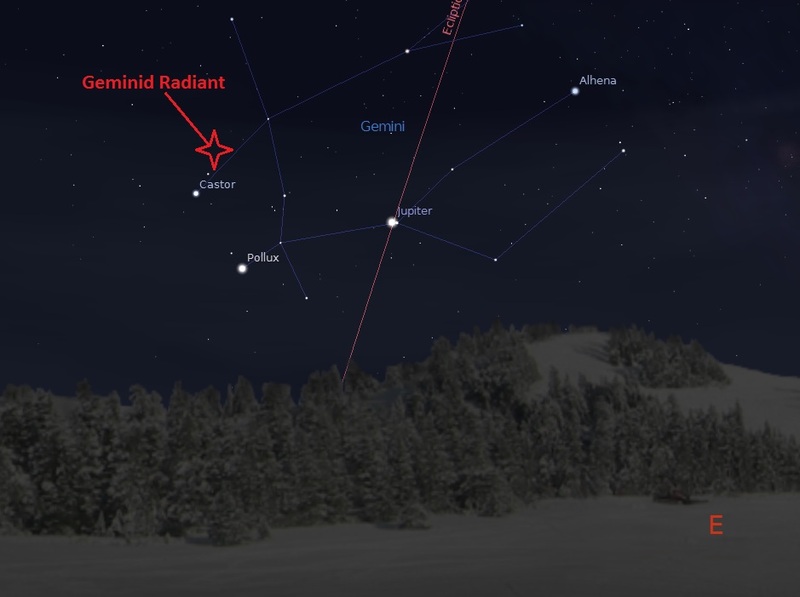 The Geminid meteor shower is consistently the most impressive celestial light show of the year. 2013's display peaks Friday night/Saturday morning, and while this year's shower will be competing with a fair bit of moonlight, it's still shaping up to be one hell of a show. Here's what you need to know to spot as many meteors as possible. We're talking all kinds of light. City lights, street lights, house lights, flashlights, any lights – this year, a bright waxing gibbous moon will already be giving off plenty of light as it is, so don't blow it by checking your indiglo watch out of habit, and DON'T LOOK AT YOUR PHONE. It is a well-known fact that backlit cellphone screens were put on this Earth to ruin meteor showers. If you're in the country, go find a big open field. If you're in the city, get out if you can. If you can't get out, try to find a high point. These measures can make a HUGE difference. The pictures featured here compare the night sky as seen from two points in Utah located just 75 miles apart. The difference? The bottom photo was taken in a major metropolitan area, the top photo a rural town. (See more info here.) The Clear Sky Chart website has a great list of optimal viewing locations organized by state, so go check it out. Once you're all settled in, give yourself at least 20 minutes for your eyes to fully adapt to the dark. How do you know if your eyes have adapted? A good rule of thumb says if you can see all seven of the Little Dipper's main stars you'll see plenty of meteors. If you can't spot all 7 it's not a big deal, you'll probably only spot that many under optimal conditions. The best time to direct your gaze skyward will be in the hours between local midnight and sunrise on Friday, December 13th and again on Saturday, December 14th. 2013's peak rate is expected to approach 120 meteors per hour, though NASA predicts that light from the waxing gibbous will outshine roughly half of those meteors. With this in mind, your best viewing opportunity may be the brief window of time separating moonset (around 4 a.m.) and dawn. That being said, 60 meteors per hour is still plenty of meteors; whether you stay up late or wake up early, odds are you going to spot quite a few shooting stars. If you've never tried it, we highly recommend using NASA's Fluxtimator applet to help you determine the best time to watch for meteors. The Fluxtimator even takes your viewing location (i.e. whether you're observing from the city or the countryside) and the brightness of the moon into account. You'll want to set the dropdown menu associated with Showers to Geminids (number four on the list), and change the date on the applet to Dec 13—14, 2013. In both New York and San Francisco, for example, the peak viewing time appears to be a little after 4:00 A.M. local time tomorrow morning. 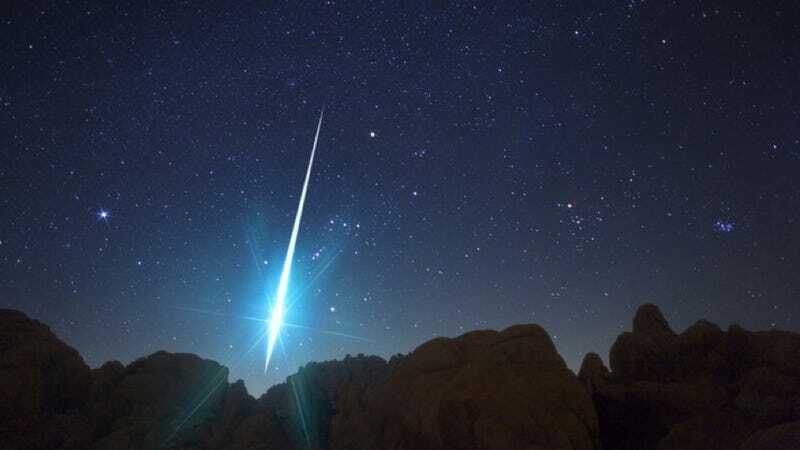 It's important to bear in mind, however, that meteors' trails tend to be shorter the closer they are to the radiant. Your best bet is to probably just look straight up, or to face away from the moon, keeping in mind that meteors can appear anywhere in the sky. If you'd like to join local experts, try looking for your neighborhood astronomy club, and find out whether they'll be setting up a telescope you can peek through with friends. Bring a reclining lawn chair, a blanket and some pillows. It's December, and you probably won't be moving around a whole lot, which means you need to dress warm: a beanie, gloves, thermals and a warm coat should do the trick — whatever you need to get comfortable and still keep your eyes on the sky. Bringing hot chocolate and/or coffee is strongly encouraged. Don't try to stand. Standing and looking up may seem like a decent enough idea, but eventually your neck will get tired, and the second you take your eyes off the sky is invariably when the brightest meteors of the night will go blazing by — it's like a code that all meteors live by. If you absolutely HAVE to look away, make sure it's for something awesome like taking a sip of hot chocolate. You shouldn't really need a telescope or binoculars, because you'll want to keep your eyes on as much of the night sky as possible. Bring something to snack on, but nothing you have to look at to eat. And finally, bring some good company, so you have somebody to "ooh" and "ahh" with while stargazing on this beautiful winter night.